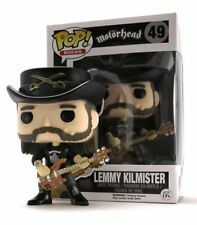 F-Toys 1/8 scale Takamine Acoustic Guitar KO-50 Miniature Model MIB U.S.A.
Lemmy Kilmister from Motorhead as a stylized POP vinyl from Funko! Figure stands 3 ¾ inches and comes in a window display box. 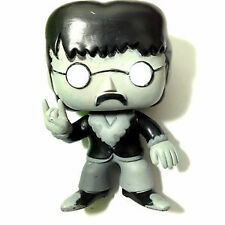 Check out the other Music figures from Funko! Collect them all!. The Guns N Roses Pop! vinyl series is a must have for any hard rock collector! Pop! Rocks: Guns N Roses includes; Axl Rose, Duff McKagan, and Slash. 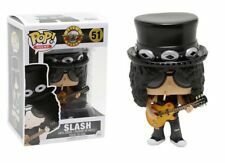 From the legendary band comes Slash as a stylized vinyl figure. Standing approximately 3 ¾ inches tall he comes packaged in a window display box. Iron Maiden Aces High Pilot Eddy ReAction Figure + Blind Box! Funko’s newest wave of Pop! Rocks is here, with even more music legends! This series features Jerry Garcia - shown with his signature guitar and glasses. Known for his fashionable taste and larger than life outfits Elton John is shown in two versions - a classic white suit and a patriotic red, white, and blue suit! Complete with iconic glasses. Rounding out the series comes front man, Kurt Cobain! Featured in his recognizable brown and green sweater. Kurt Cobain stands approximately 3 ¾ inches tall and comes packaged in a window display box. Recommended Minimum Age: 3 years - small parts not for children under 3 years. Guns N Roses front man Axl Rose is joined by guitarist Slash and bassist Duff McKagan in the Pop! Rocks: Guns N Roses series. This series is a must have for any hard rock collector. Axl Rose is posed wearing a kilt and iconic bandana while rocking with his microphone stand sideways. Axl Rose stands 3 ¾ inches tall and comes packaged in a window display box. Recommended Minimum Age: 17 years - small parts not for children under 3 years. Not a toy. One of the most influential rock bands of all time is now joining the Funko family! This series of Pop! Rocks includes all four members of the legendary band Metallica! Add James Hetfield, Lars Ulrich, Kirk Hammett, and Robert Trujillo to your Funko Pop! Rocks collection! Lady Justice stands approximately 3 ¾ inches tall and is packaged inside a window display box. Recommended Minimum Age: 3 years - small parts not for children under 3 years. Queen - Freddie Mercury Wembley 1986 Pop! Vinyl - FunKo Free Shipping! The new film focuses on Freddie's life leading up to Queen's Live Aid performance at Wembley Stadium in 1985, which is this writer's favourite musical performance, ever. At The Nile, if you're looking for it, we've got it. Few artists can pull off a crown but as the king of rap Biggie is definitely one of them. His influence on hip hop is unparalleled making it fitting that the Notorious B.I.G. vinyl figure is blinged out with a crown and chain. A second vinyl figure of the rapper is posed wearing a yellow Biggie jersey. Notorious B.I.G with Jersey stands approximately 3 ¾ inches tall and is packaged inside a window display box. Recommended Minimum Age: 3 years - small parts not suitable for children under 36 months. One of the most influential rock bands of all time is now joining the Funko family! This series of Pop! Rocks includes all four members of the legendary band Metallica! 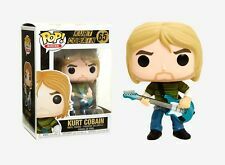 Add James Hetfield, Lars Ulrich, Kirk Hammett, and Robert Trujillo to your Funko Pop! Rocks collection! James Hetfield is featured with long blonde hair and beard he is dressed in an all-black leather ensemble. Vinyl figures stand approximately 3 ¾ inches tall and are packaged inside a window display box. Recommended Minimum Age: 3 years - small parts not for children under 3 years. Iron Maiden -- Eddie 2 Minutes to Midnight / 8" clothed figure. Clean and in good condition with his gun. No packaging displayed figure. Motley Crue 4 Piece Stage Figure Set By McFarlane Toys. All four of the collection The Motley Crue with Stage instruments. All of these are still sealed in their original Factory Packaging. I do have some very slight and matter signs of shelfware and a little bit of dust but are still in excellent condition. This is a bundle deal all four for one price.Condition is New. Shipped with USPS Priority Mail. Being sold in as-is condition no returns. An official Super7 x Iron Maiden collaboration! It stands approx. Trending at C $30.36eBay determines this price through a machine-learned model of the product's sale prices within the last 90 days. *used* Queen: Freddie Mercury S.H.Figuarts Action Figure by Bandai Tamashii. Condition is Used. Shipped with USPS Priority Mail. Wearing the iconic outfit from her “I’m a Slave 4 U” performance, the Princess of Pop Britney Spears is ready to entertain! This vinyl figure captures an iconic moment in music history while remaining timeless for any Britney fan. Britney Spears stands approximately 3 ¾ inches tall and is packaged inside a window display box. Recommended Minimum Age: 3 years - small parts not suitable for children under 36 months. Slash Stage Figure Spawn.com By McFarlane Toys. This is The Flash figure spawn.com McFarlane Toys. This item is still sealed in original Factory Packaging. the last photo shows that one of the corners of the packaging is slightly dented in. Condition is New. Shipped with USPS Priority Mail. Being sold in as-is condition no returns. Echelle 1/6èmè. C'est l'expédition internationale générale. 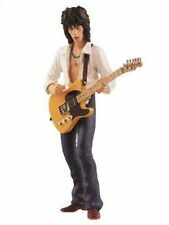 Joey Ramone 7 Inch Action Figure NECA New In Box rare figure . Condition is New. Shipped with USPS Priority Mail. New in package. The King Diamond action figure everyone wants. Get it now because I don't believe super 7 will remake these in this EDITION. JOHNNY CASH. Man In Black. McFarlane Toys Metallica Harvester Of Sorrow Kirk Hammett Action Figure Sealed. Condition is New. Please see pictures to judge condition for yourself. Shipped with USPS Priority Mail. Returns accepted on items in their original condition in sealed packaging. Thanks for looking! Ozzy Osbourne Jack in the Box - "Bark at the Moon"
Motörhead Lemmy Kilmister 2012 Icon Figure (Loco Ape) Dark Wood - CASE FRESH! Beatles Yellow Submarine 1999 wind up toy 1999 McFarlane Toys AND DVD! !